Think Microsoft will mention Kinect at today's media briefing? Hang out for our liveblog and find out! Some of the dancers from last night's Project Natal - I mean Kinect - event were out in the lobby of the Wiltern Theater, where the Media Briefing is taking place, and they're amazingly elegant. Can we say the same for Kinect? Possibly. 10:10 - So far, all we're doing is sitting and waiting, looking at couches. If you ever think you want to be a game journalist,just remember - you spend a lot of time waiting for things to happen. Sometimes there are couches. Sometimes not. 10:15 - That was sarcasm about whether or not Microsoft would be mentioning Kinect, by the way. But there were also signs warning us of Mature content in the briefing, so perhaps we'll find out just how good it is at capturing motion, wink wink. 10:20 - An announcement very politely asked us to avoid blocking the aisles, or there will be consequences. I may be making the consequences part up. 10:25 - Ladies and gentlemen, take your seats!The briefing will begin...in five minutes. Go get a sammich, I'll meet you back here. 10:30 - Ready, kids? Here we go! Video is starting. "A lie is a lie," says a grizzled soldier. Men in combat fatigues, we switch to first person to rappel in through a window. "We live in a world where everything you know is wrong." Ah, the Treyarch logo. Call of Duty Black Ops, 11.9.10. Yeah, looks pretty badass. And here comes Mark Lamia, Treyarch's studio head, to tell us more about the game. Game demo. We're crawling through a low tunnel, past body parts and tree roots. Ho, snap, enemy jumped out and knifed our pointman in the neck. Now "in the interest of time," we're jumping to a new location in the game. Out in the jungle, overlooking a helicopter. Let's cause some mayhem. Grenade launcher? Always a good choice. We've successfully stolen the copter. (One might say we got to the choppa, in fact.) Time for a little death from above. Flying over the river, we blow the crap out of a bridge, then use some pyrotechnics to do a little home improvement on the enemy base. Aw, they're shooting at us from the shoreline. How cute. Kaboom. A few more bridges go up in clouds of smoke as we fly low over the landscape. If you've ever had a jones for helicopters and things that go boom, you're probably going to want to keep your eye on this. Don Matrick, senior vp for Microsoft comes on stage. He looks like he's 12. Seriously, is he old enough to drive? 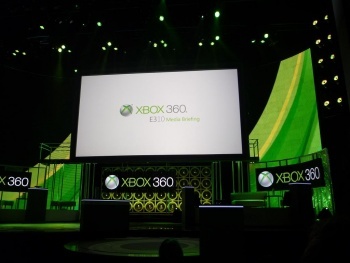 He announces that game add ons and map packs for Call of Duty will launch first on box 360 for the next three years. 10:41 - Aaaaand here comes Hideo Kojima. He's premiering the very first footage of Rising. He's passing the torch, he says, to Shigenobu Matsuyama, his young producer. Rising is an action game unlike anything you've said before, says Matsuyama. It's a philosophy called Zan-Datsu. Zan means to cut, Datsu means to take. We're going to find out how htat concept relates to Rising now. The cutting? That's as in "your enemy in half." The taking? His spine. Holy crap - the tagline is "cut at will," and they mean it. Cars, people, watermelons, buildings - if you want to cut it, you can, and at whatever angle suits your mood. The crowd erupts into applause and hoots of glee. We're a sick bunch, aren't we? 10:47 - Phil Spencer comes out to introduce CliffyB, who's here to talk about..oh, come on, like you don't know? He's going to demo four player storybased gameplay. Ooo, we're going to see mutating enemies and the female Gears. It's four player action, but the main screen shows Marcus' perspective, of course. Some big tentacle thing just hatched some other tentacletastic Locust. Marcus and team continue forward from chest high wall to chest high wall. Ah, here's a female gear, chainsawing a locust into pieces. She's totally Vasquez from Aliens. I love Vasquez. Dear Epic - thank you for making the female gears look like soldiers and not whores. A Lambent Berserker just threw a car at Marcus and friends. Its huge, has tentacles, and charges like a rhino. Just a taste today, I'm afraid, but they'll be unveiling a new game mode called Beast this week. 10:54 - Peter Molyneux is next, to give us a look a Fable 3. "Albion needs nothing less than a revolution," says the announcer over the video. "The quest to save Albion begins." The tale of two brothers battling over a kingdom looks absolutely beautiful, and features what you've come to expect - magic, action, and a dog. Bungie's Marcus Letho is here to tell us more about Halo Reach. Let's look at some gameplay footage, shall we? Yes, let's! It looks gorgeous. It looks like wicked fun. It looks...well, let's be honest, it looks like a modern Halo game, and you likely already know if that means you want to play it or not. 11:04 - Mark Whitten is here to talk about Xbox Live now. The Xbox Life community has 25 million members, only half of which are foul mouthed children. (Kiiiiddddinnnnng.) Kinect is a revolution for all of your content, not just games, he says. Imagine finding content on your tv is so simple "everyone can do it." To sign in, just wave, and Kinect recognizes you. Once you've signed in, just wave again, and Kinect takes you to a controller free menu, the Kinect hub, which has stuff like Netflix, Zune, facebok, and Last.fm. If you don't want to use your hands, you can just say "Zune" to get to the section you want. To use Kinect to operate your movies, just move your hand left and right - or again, just use your voice. Say "Xbox pause" or "Xbox play" to work the movie. "Xbox, play music!" Oh, but not Justin Bieber, please. Shuffle through your playlist by waving your hand around. Impressive, but what happens if you're having a conversation with someone and you gesture a lot? Will your music shuffle? 11:11 - Video Kinect allows you to chat with friends without a headset. You can talk with friends on Xbox Live or Messenger. We're watching a demo now of the Live Chat. By selecting one of the options at the bottom - news, sports, tv, movies, and music - and you can watch them together with whoever you're chatting with. The sound is a little tinny, but what's more interesting is that Kinect tracks you as you move around. So if you lean to the side, the camera follows you to keep you in the shot. Just say "Xbox, end chat" to shut the chat down. If the voice command actually does work that well, then yes, it seems like anyone could use it. ESPN has signed an exclusive agreement with Xbox Live to bring more than 3,500 live sporting events to the service. (Also, Trey Wingo is really cute. Just sayin'.) College football, college basketball, soccer, major league baseball and the NBA. Watching a rplay of the USC/Ohio State game, and a menu at the bottom of the screen asks which team you're rooting for: "Xbox - join USC!" If you want to catch part of it again, just "Xbox -replay!" Trivia questions and other interactive elements will pop up. You'll also be able to check live stats and info from a bar at the bottom without leaving the game you're watching. "ESPN is being redefined on Xbox." Oh, also? It's free to Xbox Live Gold members. 11:26- Kinectimals is the real name of Project Natal Discovery, that tiger baby game I mentioned earlier. Take Nintendogs and replace the stylus with your hands, and you get the basic idea. You can collect more than 40 animals and engage in 30 or so activities like...jumprope. Kinect Sports is pretty much exactly what you'd expect. Do you feel like running in place and hopping to do the hurdles? Kinect Adventures and Kinect Joy Ride are minigame collections that have some inventive ideas, but mostly just feel like Wii leftovers. Battery is running low, guys, just fyi. 11:43 - We saw a demo of Your Shape Fitness Evolved, which tracks your skeleton to help you maintain proper form. Now we're checking out Dance Central, which will turn you into a backup dancer in no time flat. Also, watching geeky developers bustin' moves is just plain adorable. Kinect will launch in North America on November 4th, with 15 launch titles. Remember that Star Wars game I mentioned? It's coming in 2011. Do. Want.